Denso Marston Nature Reserve07919 525913work Nature ReserveThe seven acre reserve is situated between the River Aire and the Denso Marston factory in Shipley, West Yorkshire. Created in 1990 on Denso Marston wash land for the benefit of wildlife, community enjoyment and education. An urban haven of woodland, meadows and pools with varied wildlife complement the other green areas in the wildlife rich Aire valley. The seven acre reserve is situated between the River Aire and the Denso Marston factory in Shipley, West Yorkshire. 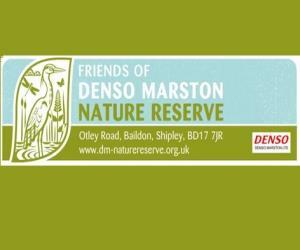 Created in 1990 on Denso Marston wash land for the benefit of wildlife, community enjoyment and education. An urban haven of woodland, meadows and pools with varied wildlife complement the other green areas in the wildlife rich Aire valley.